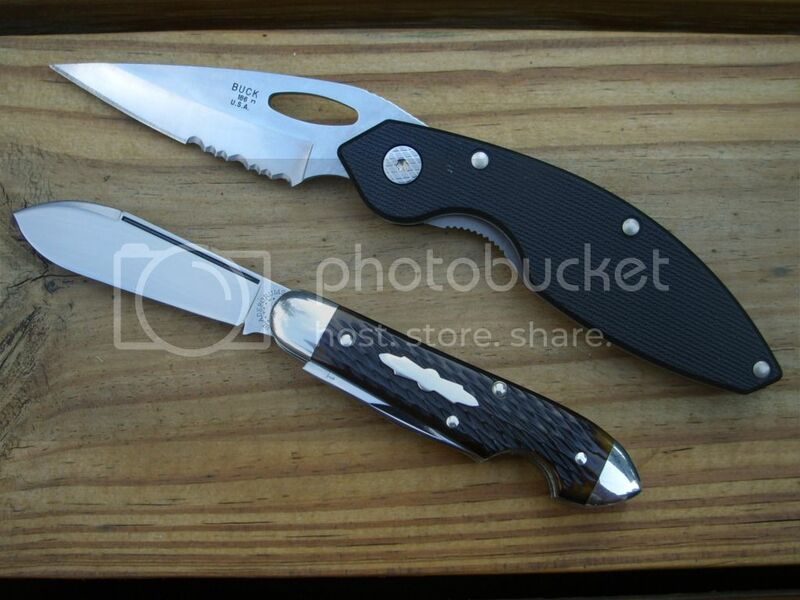 Discussion in 'Traditional Folders and Fixed Blades' started by lobodelanoche, Aug 5, 2012. I love traditinals, and they certainly get the job done and done well. But i also carry a one hander, i was wondering if any of yall do the same and if you do, what you carry? I love the Endura and Med stockman combo, but i love my peanut and endura too. Sum times I'll buy a one hander I like but always go back. Hey your combo has got everything covered! Great mix of old and new school! I'm not a two knife guy only if I carry a multi tool. My multi tool knife blades is never used. I can see the advantages or pairing taticals and slippies. I have many more slipjoints than I do one-handed openers, so each modern is matched with a few old-timey knives. This is my favorite pairing though. Folks, I'm going to let this stay open, but let's make sure that there is traditional knife content in each post. If this thread drifts off into a focus on one-handers, I will move it to General. I am a new convert of the Case Peanut but I pair mine often with my Rat-1. That way I have my Peanut for 99% of my daily knife stuff but if I happen to need to cut something quick or dirty I whip out the Rat-1. So far they are a perfect pair, though they look funny next to each other when I have them lined up on my dresser when getting ready in the morning. Peanut or pen & Sebenza when I feel I may need a locking one-hander. Ryanck93 and Sergeua like this. I haven't made a total of my knife collection/pile but let's say the Traditionals account for 99%. I have two one handed Moderns left, a BM Mini Grip& the one I use a Byrd Meadowlark. I use the Byrd up a ladder or in a tree. Paired with whatever Traditional I fancy that day. It works well is safe, cheap well-made and sharpens well, does all I need from such a knife. If I lost it, would I mind? No, I'd get another it has no attachment factor or character, functional tool nothing else. Can't see myself using it on a picnic, food prep or opening the mail, cutting shoots, household tasks. I have knives of character for that. Like most here (or so it appears), I have many more traditionals than 'tacticals', so the combinations vary. 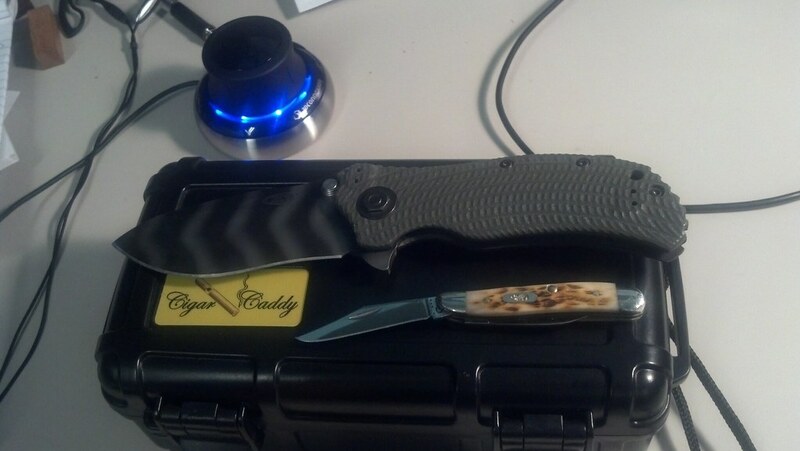 Today it's a BenchMade Mini Dejavoo and a GEC Barlow Jack. Yes i carry both, right now as i get ready for work. I just slipped a Case CV Slimline Trapper in the pocket, and just got done stropping my skyline. I have the one hand opener because I wear gloves a lot its easier to open especially if I have something in the other hand, also if someone ask for a knife they get the modern folder. I mostly use the trapper, for lunch, breaking down boxes, cutting various things. Most of the time, for me, it's a Kershaw or Spyderco one-hander plus a SAK of some flavor. I always have a modern folder and a traditional todays. Couple of weekends ago, went on a camping/fishing trip. The one handed opener was a Spyderco JD Smith which served as a filet knife. 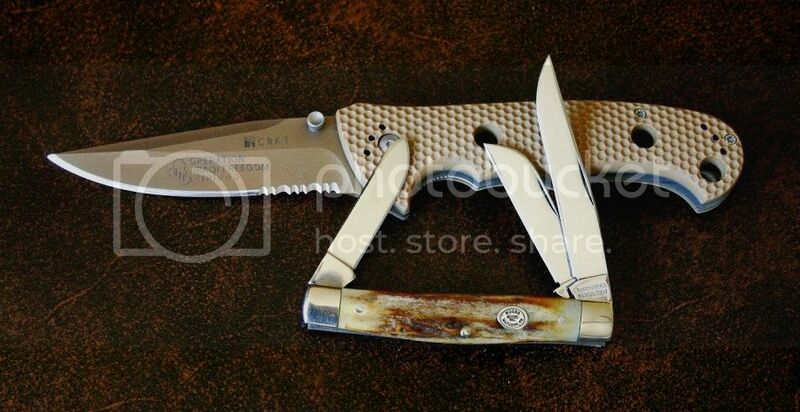 The Traditional was my new GEC Montana Workhorse Whittler in Calico Bone which did everything else. I have found the Rat 1 to be the best overall work knife I have, its the right size, and easy to open and close with one hand, even with gloves on...for me. I really like that knife, but it lacks in the some ways...and for a long time my opinel picked up where the Rat left off. I picked up a Svord peasant to see how a traditional would work for work, and at first I felt it lacked a lot, but its starting to grow on me. There was a time when I carried traditional only on weekends, or for recreation...after work, etc. But now I find I mix both and match most days but sometimes grab one kind over the other. At the moment my rat 1 is my one hander, and traditional duty falls to either the opinel, my new Douk Douk, or a svord. From time to time a small SAK jumps in as well. today these are with me. Micarta rehandled Shapleigh Diamond Edge Cattle knife and Endura 4 G-10 for me. I carry a peanut or pen with me every day. If I'm going fishing or doing yard work I also carry my skyline to which I'm not overly attached and protective. One handed opening is too handy to do without while bouncing around in waves or in waders. I very seldom carry a OHO, but when I do this is the most common combo. No, I don´t carry a modern knife anymore. The last modern knife, I carried about eight months as an EDC. I just carry my slippies (or traditional lockback or fixed blade). I don´t like the ways they look and feel. That´s the whole thing. I don´t consider SAKs as modern knives. They are also some kind of knives I like to carry often.